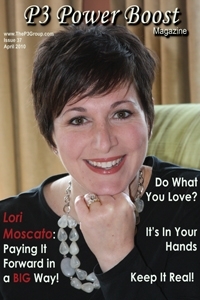 Lori Moscato Cover photo courtesy of P3 Boost magazine. Three years ago, my cousin Lori found out she and her husband Rob were pregnant with their first child. While this is a happy occasion for any would-be parents, it was an extra-special time for them, as they had struggled with infertility for years before finally trying in-vitro fertilization. Lori gave birth to Sophia nine-months later, and just fourth months after that (surprise!) the couple found out they were pregnant once again, this time naturally, with baby Ryan. This is truly a miracle story, but Lori and Rob, as well as millions of couples around the world trying to have a baby of their own, know that not everyone gets such a wonderful outcome. Which is why Lori and Rob began the Pay it Forward Fertility Foundation, to help couples like themselves fund the in-vitro process and hopefully, end up as lucky and fortunate as they were. This month, Lori is the cover girl for P3 Power Boost magazine, and this is my shameless plug of her and Rob, and all the wonderful things they are doing to help couples who truly want to bring a child into the world. Thank you guys, for everything you’re doing!